Once you have added your domain(s), the next step is to add keywords so you can start tracking. In this guide we will go in-depth on how to add relevant keywords you want to track, as well as setting up them up to fit your needs. Click on your domain and go into the keywords section, and click on "Add keywords"
Let's look into keyword options on the right side and get familiar with them. It is the country in which you wish to track your keywords. It can be any specific region, city or even address. This comes in very handy if your focus is on local SEO, as you can add as many locations as you only wish. Regardless of subscription type, you can track your keywords on both Google and Bing, as well as Desktop and Mobile. With mobile continues to increase its market share over Desktop, we always recommend tracking on both device types. While Google is the king of search engines, Bing has a strong presence in certain markets and target groups, and therefore should not be ignored. Tagging enables you to put your keywords into different categories. For example: You can tag a keyword and assign it to a specific topic. 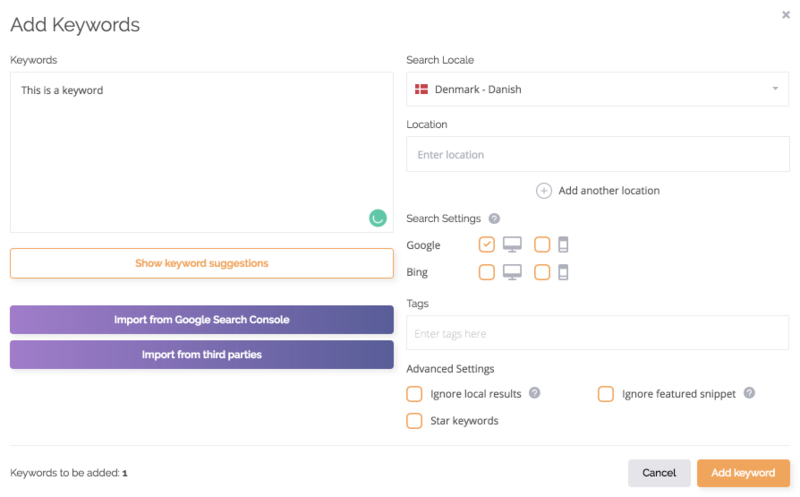 Thanks to that, you will find an easy way to organize your keywords in order to see what product group they belong to or what their priority is. This feature is used when you want to ignore Google maps snippets that display local results, these count by default as rankings. When the "Ignore Local Results" option is checked, the local results (if any) are ignored and the count begins after the local results featured snippet. This option should be checked if you don't want them to count as ranks, similar to "Ignore Local Results". You can star mark specific keywords you wish to receive notifications for in the overview section. Notifications are sent when we spot significant changes to ranks and more, click here to read more.